Had a time trial day today, which is always nice to mix it up from the road bike every now and again. Plus its never a bad thing to get out and practice handling the bike, because time trialing is a whole new world compared to road racing. The bike handles differently and you want to find a position that really works for yourself and dial it into as close as you can get to perfection. Learning how to time trial is a must because it teaches you the extreme discipline that the sport of cycling really takes for you to su cceed. Once I got started up I really wanted to use this day to focus on form and building power. So after I had strolled down Main St. in Grandview I came up on the High Grove hill climb. Knowing that there would be a “Strava” segment there for “King of the Mountain” I decided that I would start my first interval on this hill to build some power. Once I was on the hill I immediately knew I was going to have a good time on it. Sitting down staying low in the aero bars I focused on driving the power out from my legs and transferring it smoothly & efficiently through each pedal stroke, while at the same time using just as much power to pull up to follow through. Seeing how close I was from the top of the climb I knew I needed to keep the power going. Then once I reached the top I focused on increasing the tempo to drive my speed back up. 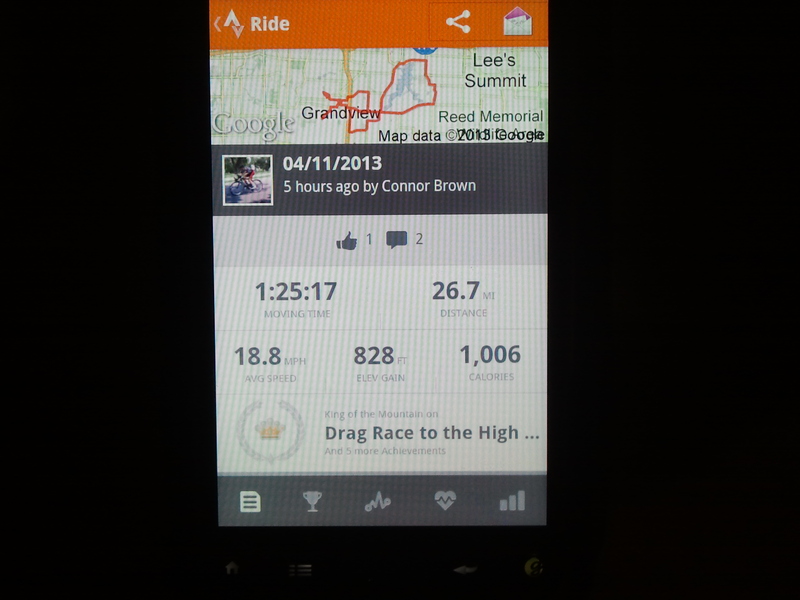 After I got done I uploaded the ride on Strava to see if I had won any King of the Mountain awards. For those who don’t know what this is, this is a tracking devise via an App on our phones that registers our data from our rides and computes our mph, the slope of the roads and some other info we riders like to geek out to. Anyway, when I got back home I checked my Strava app and sure enough there was my High Grove hill King of the Mountain. I was so happy I literally high-fived the closest wall. The best part though was the fact that an hour or so later I received a comment on the Strava upload from the previous King of the Mountain Michael Smith saying, “You stole my KOM! Nice work. Please tell me that you: 1) had a 20 mph tail wind or 2) motor pacing a semi truck? My ego is bruised.” After reading this I totally cracked up. This just goes to show you how serious Strava KOM’s are to everyone who is out there racing bikes. So much so that I wouldn’t be surprised if I saw Michael going after the KOM tomorrow. 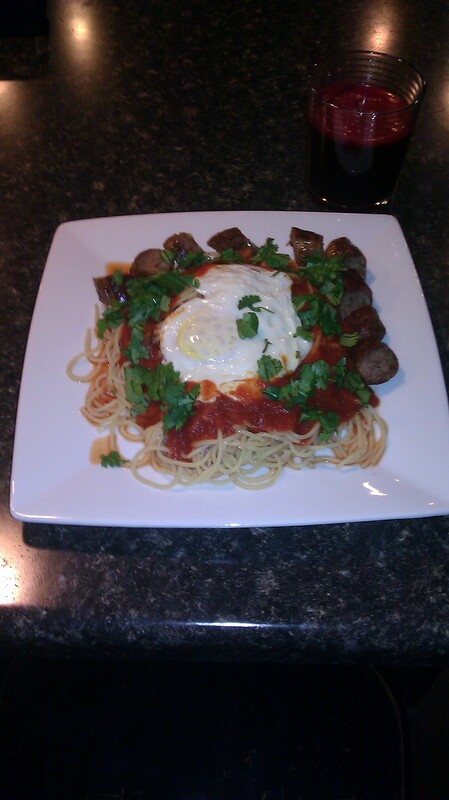 So after the laugh and some stretching it was time for dinner where tonight my Dad had prepared an awesome meal of pasta with organic red sauce, some Italian sausage, topped with egg and cilantro. I also had freshly juiced beet juice to drink. Beet juice may not be the most delightful thing to drink but it sure does wonders for your body. For those that don’t know, Beets are packed with vitamins and minerals and research has shown that they can even improve the efficiency of exercising muscles. Plus it turns your piss purple! No seriously, you will literally have purple piss. For even cooler tips on nutrition for cycling I recommend you pick up The Feed Zone cookbook written by Biju Thomas and Allen Lim. These recipes are the same ones that European world tour professional cycling athletes eat every day.